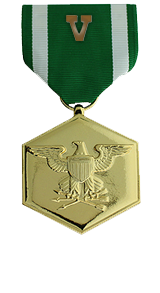 Heroic achievement while serving as Company Commander, Company K, 3d Battalion, 3d Marines, Regimental Combat Team 1, I Marine Expeditionary Force (Forward) from July 2007 to February 2008 in support of Operation IRAQI FREEDOM 06-08 and FY-08. 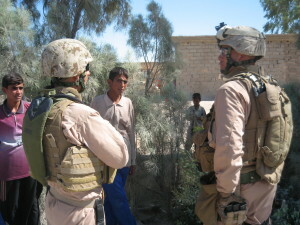 Demonstrating superb leadership and maximizing all available resources, Captain Hanson skillfully led his marines in daily counterinsurgency operations and judiciously united disparate tribes to neutralize Al-Qaeda elements from his area of operations. While conducting clearing operations on 19 September 2007, Captain Hanson’s mounted patrol was attacked with small arms fire and rocket propelled grenades. Without hesitation and under fire, Captain Hanson directed the efforts of his Marines as they successfully repelled the insurgent attack. His courage and inspiring leadership facilitated one of the most significant reductions in insurgent activity in Karmah since the beginning of combat operations and set the conditions for the successful transition of control to Iraqi Security Forces. Captain Hanson’s initiative, perseverance and total dedication to duty reflected credit upon him and upheld the highest traditions of the Marine Corps and United States Naval Service.